After our holiday at my parents in July last month, Hari and I proceeded to Bangalore to spend time with my in-laws where my little one got an opportunity to spend time with his other set of grandparents and to get a little more pampered with the love that only grandparents can shower! He also got to do other things which he doesnt normally get to do here in Mumbai, mow the lawn, water the plants ride his brand new bicycle gifted by his ajji (paternal grandmother) on the beautiful lane in front of the house and spend time with the people who love him and whom he loves. On one morning, when we were about to go out my mother-in-law quickly put this dish together. I liked it so much that I quickly took some pictures to share it with all of you. This snack is quick to put together if you have the ingredients ready. It is ideal for those unexpected guests, the times when you are rushed or hard pressed for time or the times when hunger pangs strike and you want something easy to put together fast. I love snacks made with flattened rice and this particular dish from my mother-in-laws kitchen is a favourite with me. It is lightly spicy, slightly sour and mildly sweet and the crunch of the peanuts and smooth creaminess of the coconut provide ample sensory delight to the palate. I don’t have anything else to write about this other than the fact that it is a little spicy, a little sour, a little sweet and a little salty and above all mind numbingly delicious! And that having a recipe like this in your repertoire will definitely add some variety and might even save you from racking your brains about what to make when there is little or no time on hand. Flattened rice comes in three sizes, thin, medium and thick. you need to use the thin variety for this snack. 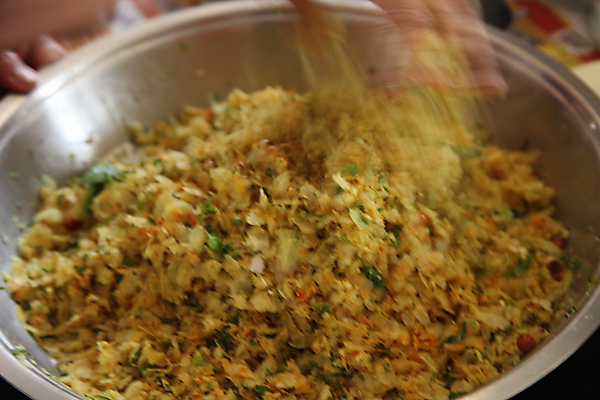 In a bowl put in the flattened rice flakes and mix in the coriander, salt, sugar, lime and coconut. In a small wok or seasoning pot, put in the vegetable oil and heat over a medium flame for a couple of minutes. Put in the peanuts and stir for two to three minutes, until they become light brown in colour. Put in the mustard and when they pop, stir in the cumin seeds. Add the curry leaves, asafetida, green chilies and turmeric in quick succession thereafter, stir for a few seconds and turn off the heat. Mix the seasoning into the prepared flattened rice. Top with more garnishing if you wish and serve as a a delicious snack anytime. lovely!!!!!! 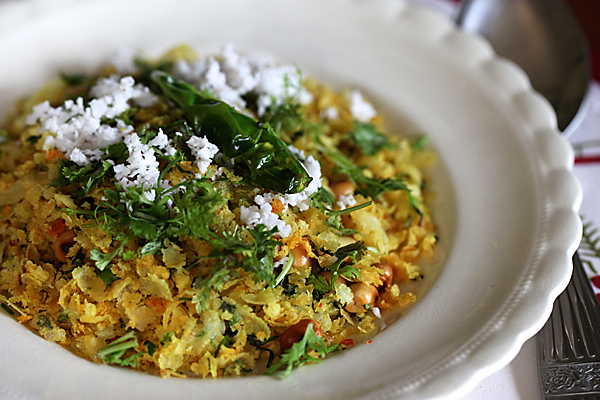 One question anu….We have to use the poha " as it is" I meant no frying or soaking in a little water? Shubhangi: Yes you have to use the thin variety and the lime juice and coconut give it the required moisture. You can also use a little whey (water of yogurt) to moisten it a bit. Nandita: True..it is a refreshing change from the usual way of making poha. This is what we Maharashtrians call dadpe pohe. Quick n easy and everyone loves it. I love poha! We have it at least twice a week. Quick, easy and tasty. I also sprinkle a little sugar on top for that hint of sweet and sour. 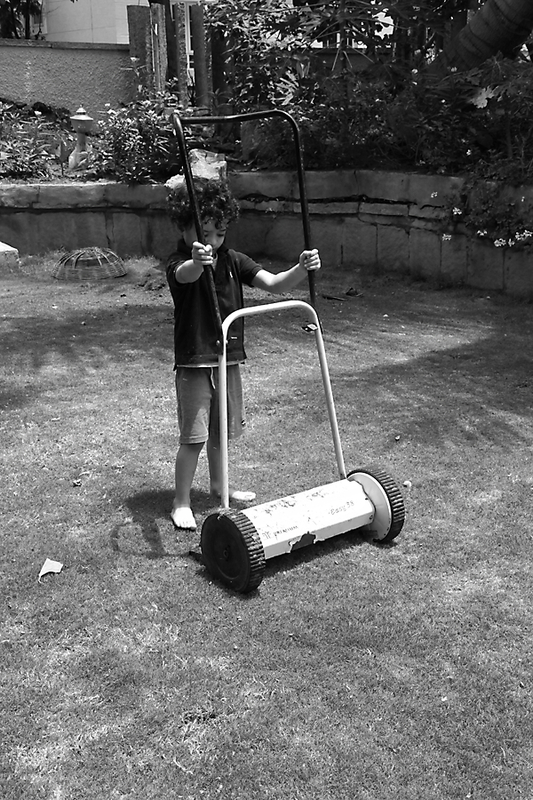 Hari looks so cute mowing the lawn! After reading your blog and your posts for BBC Good Food India, I have taken an interest in satvik cuisine. Thanks for sparking that! Wow! My favourite "Hacchid awalakki".it was a regular snack readily available all the time in my paternal grandparents house in Dharwad…. Can u also get me a recipe of " KUTTU AWALAKKI" Please? Looks so refreshing and delicious! And such beautiful pictures! Meenakshi: Thanks for the compliments. I'm really pleased to know about your interest in sattvik cuisine. Look forward to hearing more from you. Shruti: This is not what you are referring to. The "hacchida avalakki" has no lime and fresh coconut and can be stored for days in an air tight container. Will try and get you the recipe of kuttu avalakki. 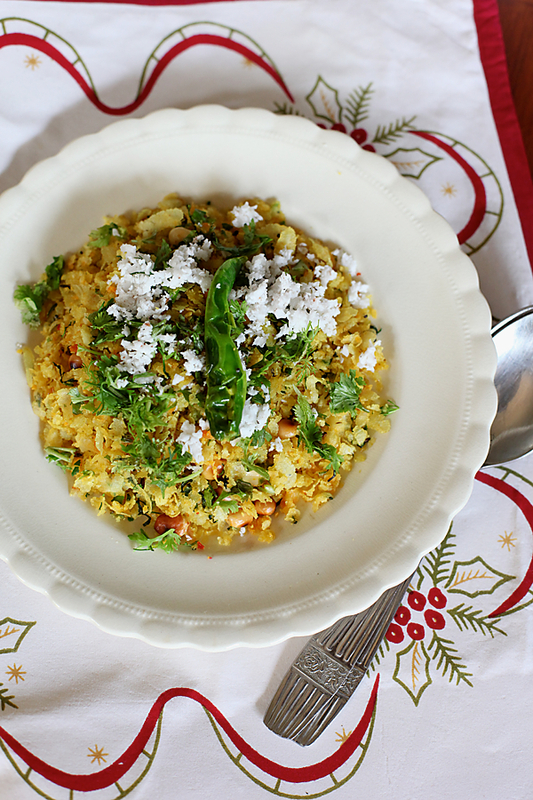 Dadpe pohe is what we call thsi in Marathi and it is my absolute fav thing to make when I have no time and I'm hungry! 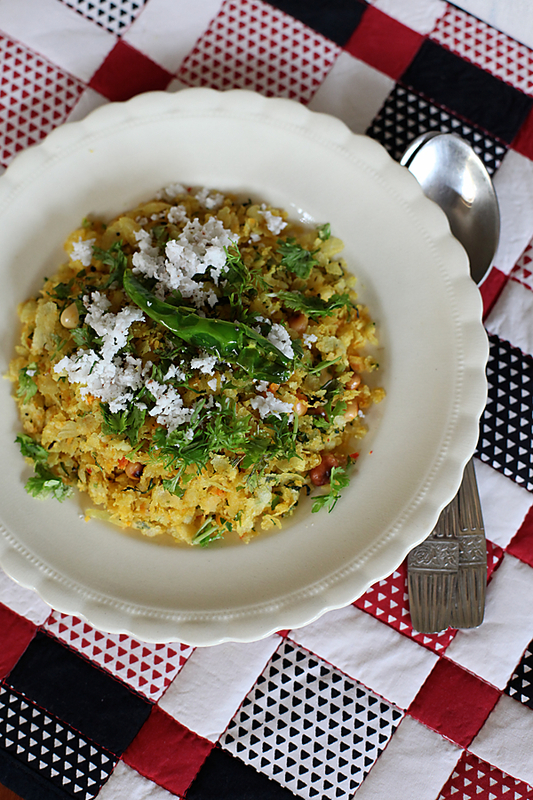 Hey Anushruti..I have been a regular follower of your website..and your recipes are really good and the photos too are excellent..We do cook the above recipe we call it "Bajila oggarne"(Bajila being the Tulu word for poha). Of course there is variation in that i don't put coriander or turmeric and also i use dry red chilli instead of green chilli. The pictures above are really appealing..so i know what to cook for this weekend.Thanks. Good job!Keep it up. Mamata: Nice to hear from you. Look forward to more rom your end. A simple snack, presented so well!